Island Health presents “Sharing the Journey” | Alzheimer Society of B.C. 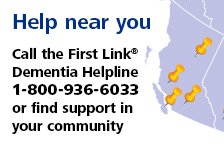 Recently, the Island Health Authority produced a series of short educational videos called Sharing the Journey, aimed at providing resources for people affected by dementia, with support from the Alzheimer Society of B.C. and funded by the Victoria Hospitals Foundation. Projects like Sharing the Journey are examples of meaningful collaboration to support British Columbians to have a better experience of the journey when someone in their life is living with dementia. The 18-part video series is aimed at providing family caregivers practical suggestions to help them respond to new challenges while maintaining a meaningful and healthy relationship with someone living with dementia. Each video shares information from experts and family caregivers about many of the common challenges faced by families living with dementia. The videos include interviews with caregivers and dramatizations. Ultimately, these videos are useful for anyone in the community who may have someone in their life who is living with dementia and wants to be able to support them. Topics addressed in the series include communication, environment, wandering and many others. To view the entire series, click here.